Kevin Ferrer leads UST past FEU in Game 2 of UAAP 78 Finals (Video Highlights) - Balita Boss! Kevin Ferrer led the University of Santo Tomas (UST) to beat the Far Eastern University (FEU) Tamaraws, 62-56, and force a deciding game 3 in the University Athletic Association of the Philippines (UAAP) Season 78 Basketbal Finals. After being down in the first half 21-30, the Tigers fought back, thanks to Ferrer who came to life, hitting six three-pointers in a 24-point third-quarter explosion to win the game before a crowd of almost 22,000 fans at the Smart Araneta Coliseum. Ferrer also grabbed 10 rebounds in a double-double effort for the Tigers. Abdul added 11 points and six rebounds while Ed Daquioag chipped in 10 points, six rebounds, four assists and a steal. 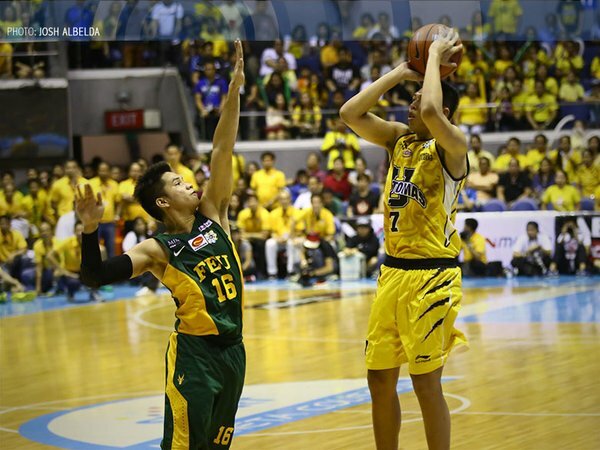 Mac Belo had 16 points and 11 rebounds, while Roger Pogoy had 12 points for Tamaraws. Game 3 is on Wednesday at Mall of Asia Arena with both teams looking to end a long championship drought.